Come and discover some of the wonderful unique little shops and centuries old craftsmanship that goes into the making of things that geisha use. 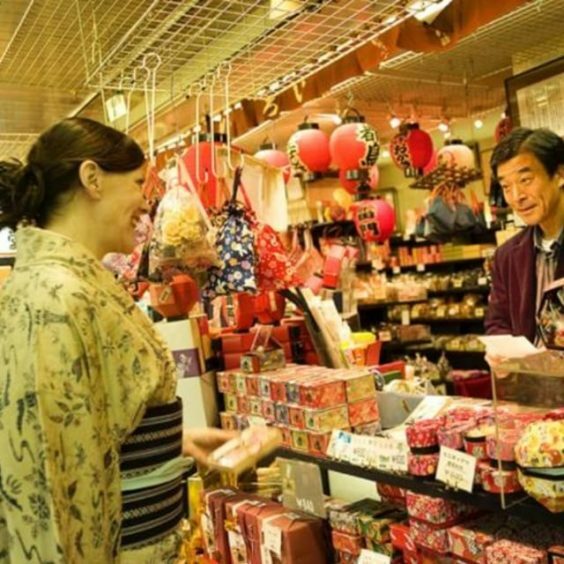 Look at the beautiful carved hair ornaments, silk bags, beautiful woven fabrics, hand-painted geisha fans, miniature carved toys from all over Japan, handcrafted paper for letters, cards and calendars, and even the geisha underwear shop! On this tour, you will explore Asakusa’s most famous traditional geisha shops and have the opportunity to buy unique and original geisha’s products with assistance from your guide. Shopping at the shops that geisha use gives a fascinating insight into the beauty of this very elegant world and a glimpse into the incredible craftsmanship involved in making products that have been around for centuries. You will also get the opportunity to converse with Sayuki, the first westerner to become a geisha in Japan and own an independent geisha house, or one of Sayuki’s trainees about the secretive world of geisha and gain insightful knowledge. This tour may be run by Sayuki, herself, from time to time and by request, but will usually be run by Sayuki’s trainees. This is a way to let the prospective geishas practice their English skills and get some income during the crucial first year when they are training to become geisha. It also allows geisha to continue the beautiful geisha tradition in Japan. This is a private tour, which allows the customers to customize the tour to their requirements. This includes choosing their own departure time and also their departure point.